I got home from the European Open late Tuesday evening, so Chispa didn't make it back to the household until Wednesday morning. She grew! And, oh, I was so happy to see her. She seemed especially happy to see me, which made me feel great, but I'm guessing she greets just about everybody with a similar zest, so it's possible she was just responding to MY especially effusive greetings. Chispa 4.5 months. She is bigger than Axel now! While I was in France, at the European Open, I got to see FIVE of her littermates, all in tow with people either competing or visiting to spectate. They are all cool little creatures. I also got to see FOUR half siblings, either from her mom or her dad, in the ring competing. I am so excited about this little puppy; there's a strong belief within me that she is great, and that she will continue to be great. The only limit will be ME. 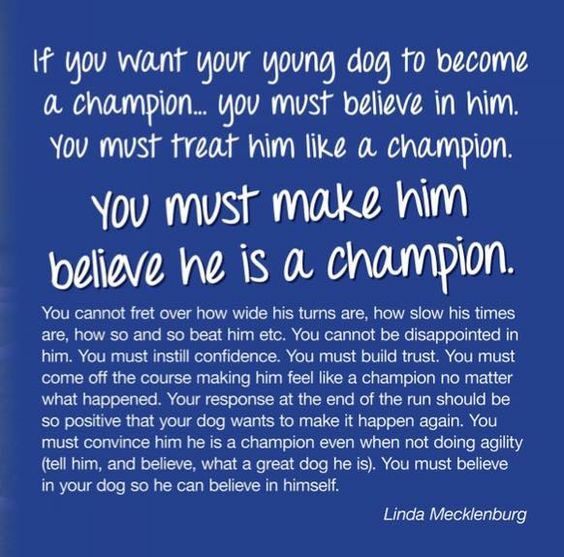 Without that faith, without that belief, our dogs are DEFINITELY limited. With that belief, their potential for greatness isn't limitless, but certainly, it's greatly expanded. So, I think my puppy is amazing. I'm pretty sure my skills as a trainer are up to snuff. Now what? 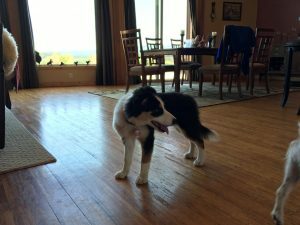 Chispa seems very game to play, and I am totally in love with her – but this was not the case for me with Frodo, and so I'm well aware that it's not THIS easy for everybody with their puppy. Not everybody's puppy is latched on to them immediately. Frodo, for example, curled up in a corner and wanted to hide when I first started trying to clicker train him. NOW, he's fine. And NOW, I can look back and say that probably if I was less close to the whole thing, I could have more quickly found a way to speak his language. But at the time? It was not what I would call fun. It was more of a thing I knew needed to happen, and through the process of the training, eventually, we found a way to connect. But that connection was not there from the start. So, if it seems like I'm gushing and bragging about Chispa, I promise you, part of it is that I've been there, with a puppy I don't really feel connected with, and it DOES work out, for the most part. And I'm even more grateful for Chispa because of it. The REAL trick will be to stay open, and greatful, when the NEXT puppy comes along that I don't have an instant bond with – because it's bound to happen again. Chispa is 4.5 months old now, and while I was away in France, she popped out most of her front teeth, to be replaced with the most ridiculously large adult teeth. 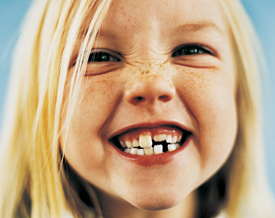 You know, that look kids have, when they're rail thin and have HUGE brand new sparkly teeth? Big, shiny, new TEETH. Just need to grow in to them now! Yep, that's Chispa. This morning, on our walk, of her own volition, she got in the pond and started swimming. I didn't even realize she'd gone in; she was ahead of me on the trail, and I didn't hear a sploosh or anything. Just, there she was, swimming by herself. We kept going down the trail til we got to the dock, and she hopped in again, milling around with all the dogs that were with us. She swam and swam and swam. And, much to my delight, she did not swim and swallow water, the way Solar and Jester like to do. And now, she is SLEEPING, giving me some time to catch up on this blog, and other much needed items on the to-do list. Anyway, what's next on my list? Now, things are going to start to get even more fun, because now, I'm going to start in on tricks. Fun tricks. Tricks that require a lot of microfailures. Try, try again. Have fun. Try, reward. Try, no reward. Lots of encouragement. Get your body and your brain to do some neat things. Solar learned a ton of tricks as a puppy. I didn't polish a lot of them, but they were fun to try and train, and definitely set the stage for teamwork in the future.